Shocking news from WRAL late in the evening on Saturday: Ronnie Sturdivant, owner of the Corcoran St. parking garage/former Jack Tar Motel and the W. Chapel Hill St. hotel that's become the Urban Merchant Center, was shot and killed on Saturday afternoon. Barry Wayne Kaalund is charged with murder in the death of Ronnie Sturdivant, owner of Urban Merchants, located at 605 West Chapel Hill St.
Officers responding to a gunshot call at the store just before 4:30 a.m. p.m. Saturday found Sturdivant shot several times. He was pronounced dead at the scene by emergency personnel. Sturdivant was in the news just two weeks ago following the latest move by City officials to attempt to force the property owner to clean up the W. Chapel Hill St. facility. My thoughts, and I hope those of all BCR readers, are with Sturdivant's wife and family at this very difficult time. Update: I've updated the post to correct that this happened around 4:30 pm, not am. Thanks to a reader for catching that. Kaalund, from what little research I've been able to do, Mr. Kaalund appears to be a long-standing member of the Durham community; formerly a homeowner off Kent St.; a UNC grad; quoted in local news articles at the opening of a cultural center in the Triangle a few years back. And the comments of Pat Murray (the publisher of the terrific Durham Skywriter newspaper) suggest there is much more to learn about this story. Kaalund is being held without bond in the Durham County jail. Old Duke St. hotel gives up the condo for good; set for Sheraton future? It's rare indeed when we raise a toast to a failed downtown renovation project. But where the Duke Studio Condos are concerned, that time has officially and happily come -- with the added bonus of still more good news, the reported transformation of the site to a Sheraton hotel property. 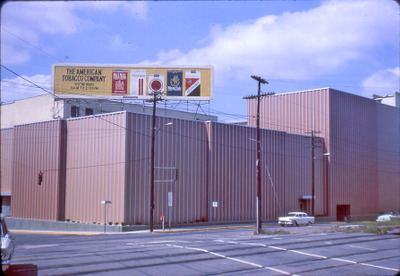 For those who are new to to the matter, we're talking about the old hotel on Willard St. abutting Duke St., near American Tobacco -- a one-time Ramada Inn and later Crown Park Hotel that Durham Centre developer Frank Wittenberg promised to redevelop as the Duke Studio Condos. Surprisingly, the scheme to slap some Estee Lauder on the porcine structure and parcel it off as condos went nowhere; whether due to the high (on a per sq. ft. basis) price or the eyebrow-raising monthly utilities and HOA dues, we'll never know. Last time we checked in on this little slice of ugly, the property owner, one DB Durham LLC, seemingly connected to a Florida-based lender, had announced the cancellation of the condo project and the property's sale, as of November 2007. Sorry to delve into meta-blogging for the second time in as many weeks, but a quick update on the paucity of posting this week. First, a quick thanks to the nice people at Duke Today for featuring Bull City Rising in their profile of Duke employees blogging about Durham. Check out the article and look for the links to plenty o' Durham blogs. That said, I'm quoted in Duke Today a second time today -- on a subject that explains why things have been a wee bit quiet here this week. The blog life happens in those interstitial spaces between work and sleep; when work expands to fill that void, as it has of late in my own career, the blog naturally slows down a bit. An updated sneak peek at the Durham Performing Arts Center featuring construction progress photos. A look at long-range transportation planning, including at least one possible future road that might make you sit up and say, where'd that come from? Neckdown and traffic calming updates, including one from the controversial Anderson St. project. Also coming up here at BCR in the coming weeks: A refresh of the site design that's entering the home stretch, plus a little more explanation of the advertising section you see on the left-hand side of the page -- along with a like-minded feature joining it that we'll be one of the first hyperlocal sites in the U.S. to feature. Thanks for reading and commenting. Though I haven't had as much time to comment back these last couple of weeks, it's the community interaction and exchanges that make this, for me, so rewarding to work on. Thanks! We talked here yesterday about the seemingly unusual presence of the Rev. Mel Whitley as a participant in the strategizing around how to pass the prepared foods tax. A surprising role for the activist, and one that seemed to have the imprimatur of Mayor Bell on it. Wonder no more: A well-placed source confirms that Whitley -- a man whose name is sometimes bandied about as an eventual successor to Howard Clement on the City Council -- participated in the planning meeting at Bill Bell's request. Hizzoner reportedly contacted Whitley personally the night before the meeting and asked the reverend to sit in on the meeting. As attractive as the downtown streetscape improvements have been here in our Bull City, the crosswalks have raised their fair share of grumblings, too -- particularly from bicyclists and pedestrians, who've reported a number of slip-and-fall situations in the wintertime when the stamped concrete pavers themselves got iced over. We have been working to make Durham as safe as possible. Two departments respond when there is ice reported. The Street Maintenance Department will mobilize to place salt and sand on icy areas and have a route that incorporates the stamped concrete downtown. General Services will also respond and will place sand and salt on the downtown sidewalks where there are pavers. Our direction is to anticipate the ice event if possible and place salt and sand. As always we will respond to any reported icy surfaces. We currently use a device to measure the temperature of road surfaces to anticipate the need for salt and sand. According to Bike & Ped Advisory Commission member Diane Daniel, the City has no plans to add any new surface treatment to the pavers, a request that some observers had made, given that Durham's investigation of the matter found these materials to be "are industry standards widely used." The Herald-Sun reported today that The Music Loft, a long-time stalwart of the Ninth Street district from its perch on Markham Ave., closed this Saturday after just over a quarter-century in business. The move comes less than two years after the opening of national chain Guitar Center up at Northgate Mall, a short drive from Ninth Street. It's hard for local stores to compete with the big-box retailers -- doubtlessly why Ninth Street's The Regulator breathed a sigh of relief after efforts by Northgate to attract a Barnes & Noble or Borders fell through a couple of years back. No word on what the disposition of the property will be. Founder Jay Miller still owns the building, according to the H-S's Monica Chen, but sold the business eight years ago to another individual. H-S hints at Mayor's backing for meals tax? In the 1% prepared foods tax discussions, one of the more interesting aspects of the uneasy dance between Durham's elected leaders and the Durham Committee on the Affairs of Black People has been just how much support the former would give for the measure given the opposition of the latter. Bill Bell in particular came under some criticism from tax supporters for what was perceived as lukewarm support for the measure in his comments to the press after the General Assembly approved the measure, as in an N&O interview some weeks back. Multiple meals tax backers told BCR in the wake of those comments that it wasn't clear at all that Bell was going to stand up for the tax and that any lobbying would need to come from other parts of the community. 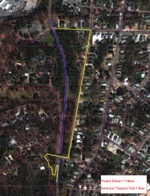 American Tobacco Trail users will find themselves making a bit of a detour near the Forest Hills and Southside/St. Theresa neighborhood next week. The ATT will be closed between Enterprise St. and the Apex St. Bridge for three weeks beginning Sept. 2 as part of a gas line relocation; during this time no traffic will be allowed on that segment of the ATT. The utility work is a precursor to the upcoming removal of the Apex St. Bridge, as approved two years ago by City Council. The bridge was initially constructed by the American Tobacco Company to provide a route around trains running from their factory southward along today's trail corridor; these trains frequently held up traffic on Enterprise St., and the Apex St. connector provided a vehicular bypass. The bridge connects two very different communities -- wealthy Forest Hills, and the much-poorer and more heavily-minority Southside/St. Theresa neighborhood to its east. City Council debated vigorously for years the future of the decaying bridge. Somehow I missed this little follow-up to the Harvard Ave. paving story we talked about here a few weeks back. In case you don't remember, there was a bit of a dust-up over the City's decision to move Harvard Ave. to the top of the pecking order for paving, ahead of a number of roads that completed the petition process successfully and were promised to be paved in the selling process for street and sidewalk bonds in 2007. Bill Bell -- who was suggested as the party responsible for the switch in the Herald-Sun's coverage of the story -- responded last week with an opinion piece in the paper where he disputed that notion. First, Bell argues, the desire of Harvard Ave. residents to see paving happen (a process stymied by the long opposition of a landowning church that refused to sign a petition) has been well known as an issue "long before I became mayor," a point on which Bell is absolutely correct. I meet weekly with the city manager. My meetings are not public meetings but at times they do include citizens, where I felt it was important to have them present and the appropriate staff present to attempt to address their issues. However, none of my meetings concerning Harvard Avenue involved any persons other than the city staff. Over the last few months, Charlotte-based SignArt has been installing the "Old Bull" sign on top of the building of the same name in American Tobacco's Phase II. Note that the sign sits where an additional story once did on the Italianate beauty. I doubt the Dukes could have pictured a giant neon sign on top of Old Bull; then again, I doubt they ever expected it would have had metal siding on it, as it did for decades, hiding the Italianate architecture.